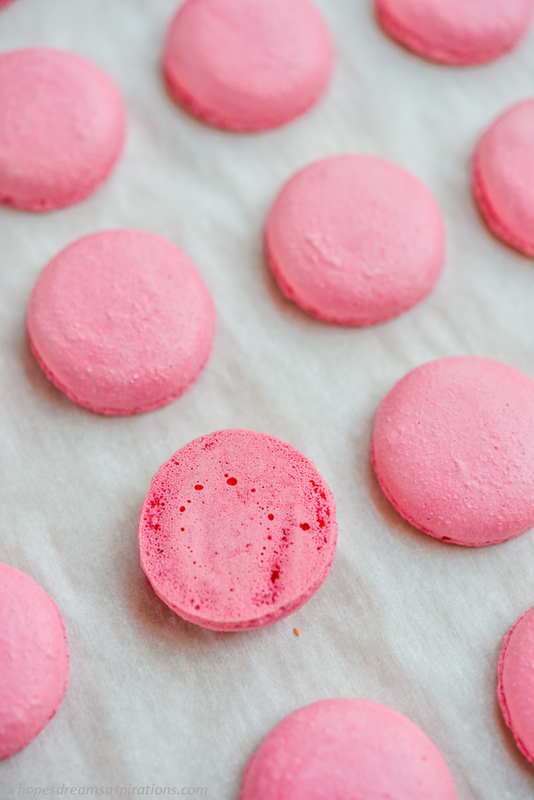 This is my basic macaron shell recipe, adapted from Adriano Zumbo’s recipes. 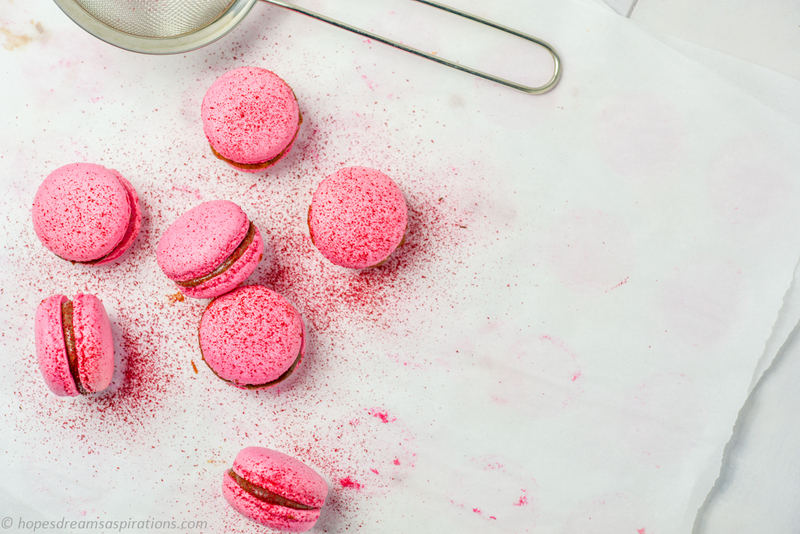 For flavour combinations, check out my regular posts under the Sweet Treats – Macarons tab. 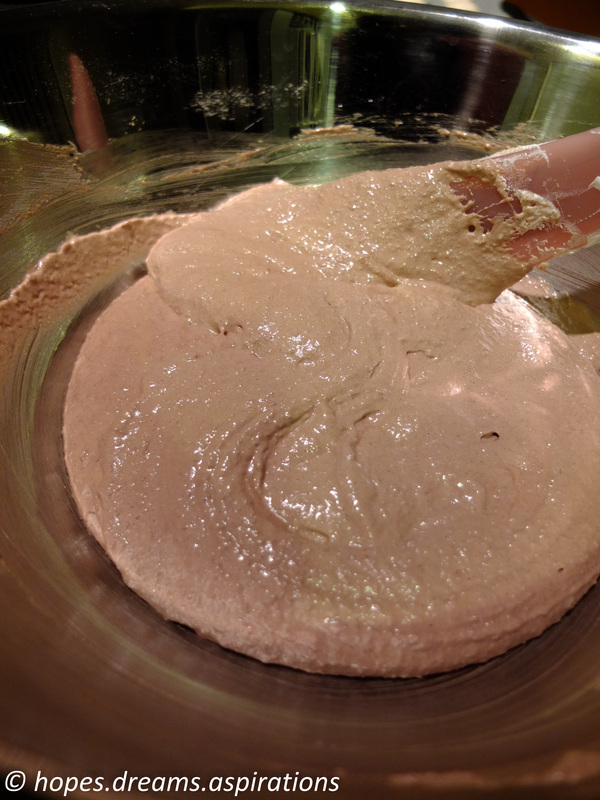 Once the sugar syrup has reached 118°C (soft ball stage), take the saucepan off the heat, keep the mixer speed on medium and slowly trickle the sugar syrup in, down the side of the bowl. (Be warned not to get the syrup onto the whisk as you will then have spun sugar.) Increase speed to high and whisk until the bowl is warm to touch, about 8 minutes. 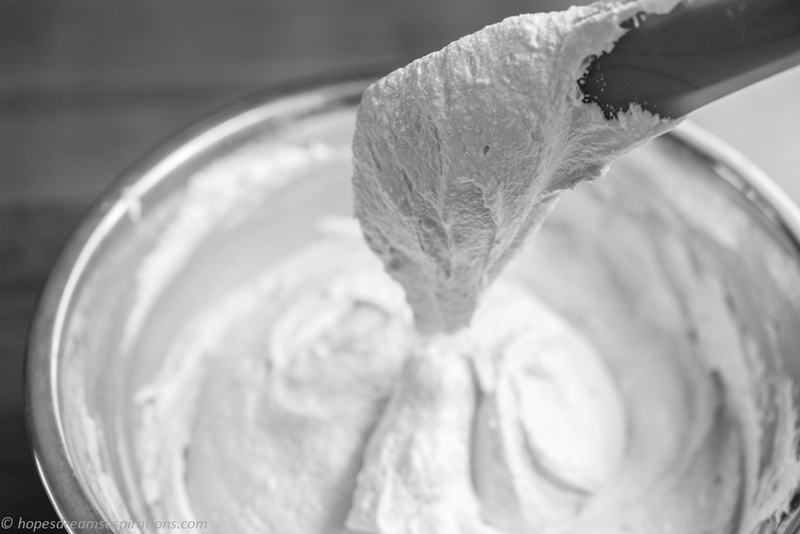 Add the second lot of egg whites to the almond meal mix, then add the meringue and use a large spatula to thoroughly combine it. 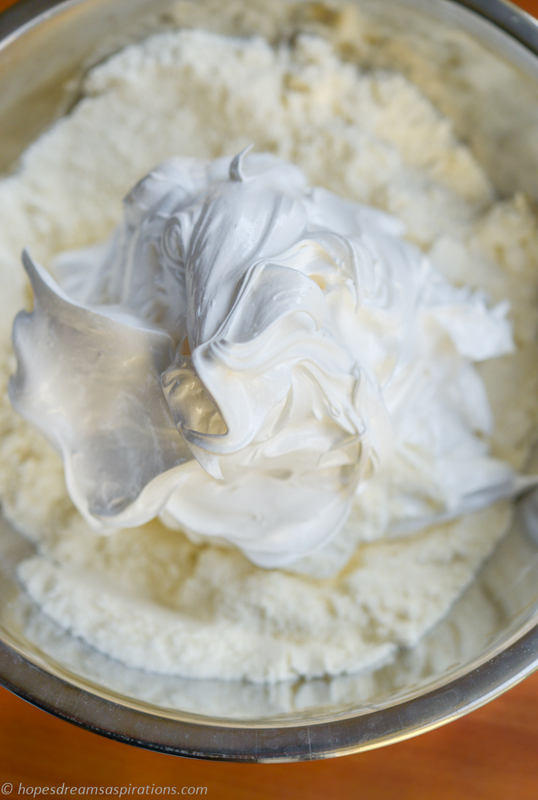 Continue mixing it to soften the meringue. Don’t be afraid to slap the mixture down. To achieve “macaronnage”, I mixed the batter about 25 times. Don’t over do this. The batter is ready when it forms an upside-down triangle on your spatula when lifted up. Scoop half into a piping bag fitted with a #12 Wilton tip, and pipe. 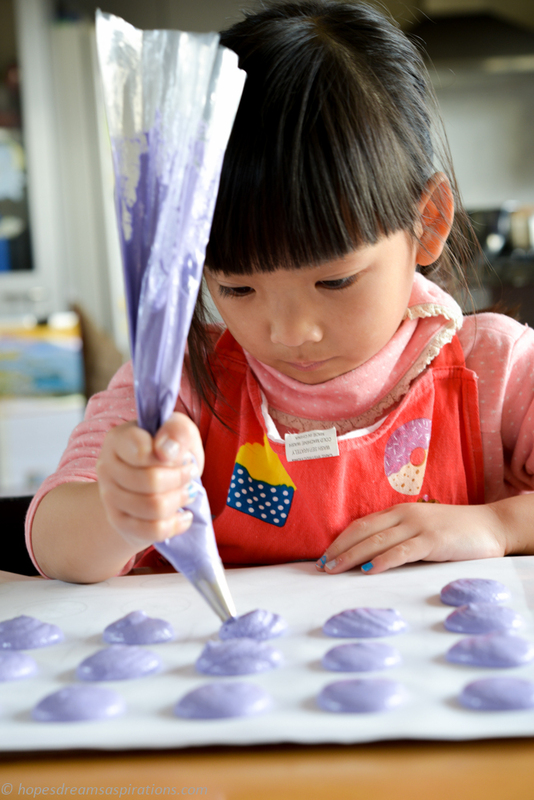 To get even rounds, hold the piping bag above the baking sheet, with the tip at a 45 degree angle. Squeeze the mixture in the centre of the rounds and as it is close to filling the circle, stop squeezing and flick the tip from three o’clock to 6 o’clock. This ensures a smooth top. You can even pipe different shapes. Bang the sheet on the bench to get rid of any air bubbles. Allow 30 minutes for a skin to be formed. 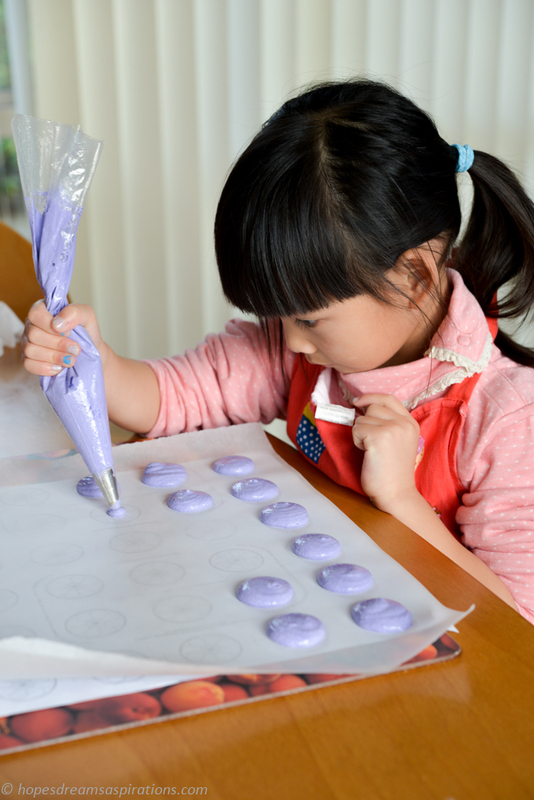 They are ready to be baked when they pass the “touch” test: no sticky residue when touched lightly with your finger. 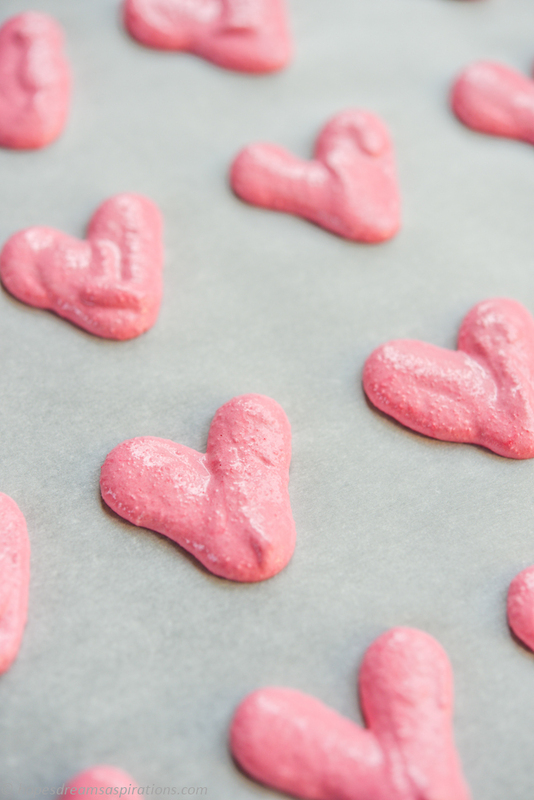 Fan-bake them at 125°C, for 17 -18 minutes. After a few minutes in the oven, you should see them rising nicely. 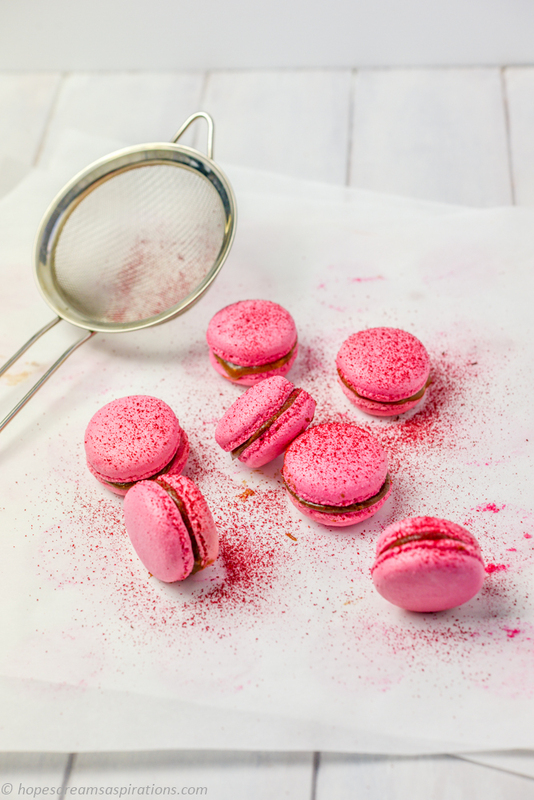 Once out of the oven, leave the macarons for 2 minutes on its trays. They should peel off the baking paper quite easily. Slide the whole sheet off the baking sheet onto a cool counter top. This causes a thermal shock and will make it even easier to peel off.